Grace is getting what we don’t deserve; mercy is not getting what we do deserve. 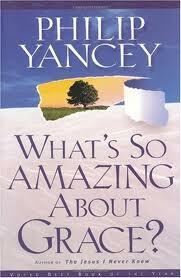 This entry was posted in Five Star, Non-Fiction and tagged faith, grace, Philip Yancey, What's So Amazing about Grace?. Bookmark the permalink. Thanks, Joanne. Just this week I started a new book about “dispensing grace to a thirsty world.” You give me a boost, and I’ll try to be non-cheesy. Thanks for the insights you bring to those of us who do not have the time or make the time for reading books. It provides with options as to what to read next.